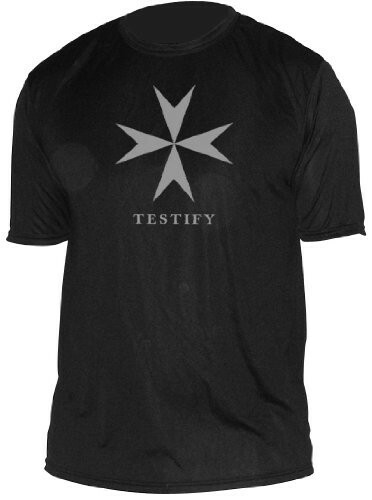 Black Shirt with Silver Symbol Symbol: Maltese Cross Symbol History: The history of the cross dates to the 11th century and is attributed to an order of monks dedicated to St. John the Baptist. The monks took vows of poverty, chastity and obedience and ministered to the sick and weary pilgrims of all faiths who visited the Holy Land. The order selected the eight-pointed cross to represent the eight beatitudes from Christ's Sermon on the Mount. The four arms represent the four cardinal virtues: Prudence Justice, Temperence, and Fortitude. The cross became known as the Maltese Cross when the order relocated to island of Malta, becoming known as The Knights of Malta. 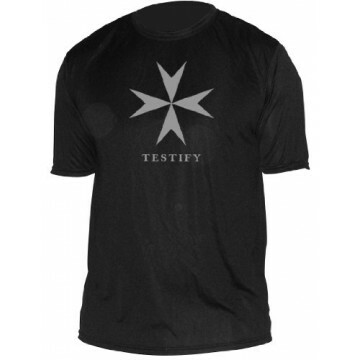 The symbol is used to represent St. John the Baptist, and is depicted as a silver cross on a black field. Today, the Maltese Cross is also frequently used as an emblem by firefighters. Scripture Passage: The term "Testify" is a one-word summary of John the Baptist's mission on earth, eloquently described in the Gospel of John: "There was a man sent from God, whose name was John. This man came for a witness, to give testimony of the light, that all men might believe through him. He was not the light, but was to give testimony of the light. That was the true light, which enlighteneth every man that cometh into this world."